We would appreciate donated e-waste. It would be most convenient to bring it when dropping off or picking up your child at school. We will accept all types of e-waste, which includes batteries, televisions, telephones, cables, and chargers. Above are the times that we will be at the flagpole for drop off. Sunday, May 24 from 10 to 3, we will be having a bake sale at the Rose Garden to support our organization. We will also be collecting e-waste! Hope to see you there. 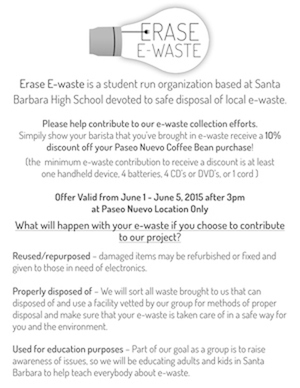 Erase E-Waste is picking-up e-waste in San Roque, so email us to plan a time when we can pick up your e-waste. You can find our email on the contacts page. We teamed up with Coffee Bean and Tea Leaf to get you 10% off your drink order. 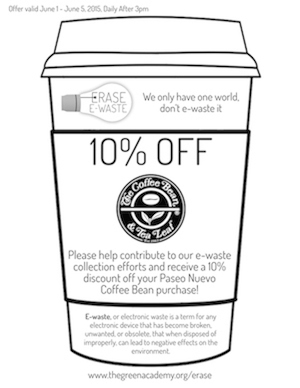 All you have to do is bring e-waste to the Coffee Bean on State Street from June 1 - June 5 only after 3pm! The week of June 1st our outreach team informed the children at local elementary schools about e-waste and told them how they could help. We gave the children bags to bring home and fill with e-waste, which they brought back to us to help support our organization.